The Windmills have been spinning wildly since last week's announcement of our return to nukes (see this blog). Plenty of dark tunnels, caverns, and half forgotten dreams, all served up by the usual bunch of tossers. 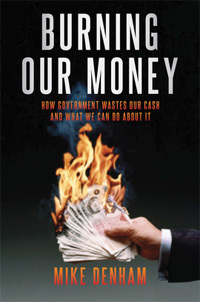 They'd like us to believe that nuclear power is both dangerous and expensive, and that we'd be much better advised pouring money into eco friendly "renewables" (or better still, abandoning our selfish hedonistic ways and returning to the purity of the Stone Age). Faced with rocketing fuel bills, I suspect most of us are focusing on the economics of those much hyped green alternatives for the first time. One of the most hyped is wind power (if you're already up to speed with windmills, then pass on- what follows is so the Major and I can understand it). When you know nothing about it, wind power sounds brilliant. After all, Britain's quite windy, and the wind is as free as... er, the wind. Plus, there are no carbon emissions, and we can't get held to ransom by Russian oligarchs or other nasty foreigners. Except when you probe into the details, it isn't. 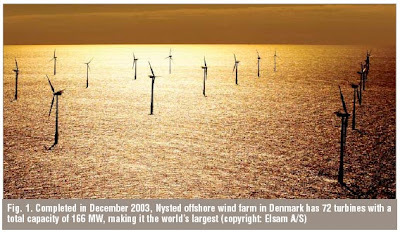 Denmark is the world leader in terms of the proportion of wind power in overall electricity generation capacity, and the country is often presented as the energy model for us. But a fascinating paper by Hugh Sharman in Civil Engineering walks us through exactly why it wouldn't work here (HTP A Reader). Now, we non-specialists need to remember a simple but key point about electricity: it can't be stored. Yes, there are various techniques like using off-peak power to pump water uphill- or to compress air- which can then be used to drive generators later. But in reality, they are expensive and limited in application (the existing UK reservoir storage system at Dinorwig can cover 5% of generating capacity for five hours). 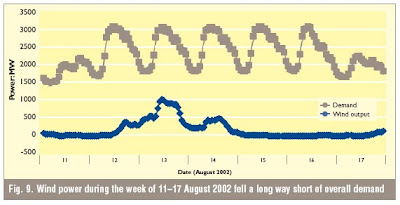 They can't deal with the large and largely unpredictable peaks and troughs of wind power. Given that electricity can't be stored on a large scale, demand and supply need to be balanced dynamically by grid controllers. That means being able to call on additional generating capacity as demand fluctuates through the day and through the seasons. No wonder grid managers are not keen. Indeed, according to this briefing paper, "grid management authorities faced with the need to be able to dispatch power at short notice treat wind-generated power not as an available source of supply which can be called upon when needed but as an unpredictable drop in demand." What's more, because of this extreme variability, on average, wind turbine generators operate far below their theoretical capacity. 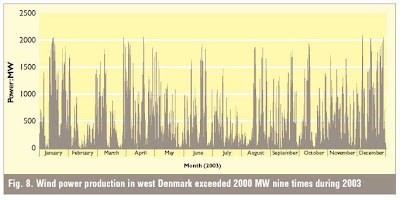 Denmark's operate at 80% below theoretical maximum capacity. Or to put it the other way round, their "load factor" is just 20%. That of course, increases costs. According to Sharman, each 1,000 Mw of installed capacity costs on average £1bn (50% onshore and 50% offshore). But if it's only operating at a 20% load factor, to get a real 1,000 Mw you must multiply that by 5, equals £5bn. On Sharman's calculations that would mean the government's renewables target involves spending over £40bn on wind generators. Even if we spend £40bn and install 41,000 Mw of wind generation capacity, because the power would still be variable and unpredictable, we'd need some back up. In that respect, Denmark is in a much better position than us. They are linked into the much larger grids of Sweden, Norway, and Germany, so they can draw back up supplies when the wind drops (or blows too hard for generation- oh yes, there's that problem as well). And since Denmark is relatively small, they can draw this back up from their larger neighbours without too much of a problem. Moreover, the process is greatly assisted by the fact that both Norway and Sweden have a lot of hydro electricity, which turns out to be a lot easier to ramp up and down than other potential back-ups. None of this is available to us. We can import a little bit from France, but not on Denmark's scale. In reality, to make wind power workable, we'd need to maintain/install massive back up here in the form of conventional power stations. How much? The normal industry rule of thumb is that wind power needs 90% back up capacity. 90%! And hydro aside (where suitable UK sites are very limited), ramping output up and down in conventional power stations is both costly and highly carbon generative. The bottom line is that windmills may be a highly seductive idea from a distance, but once you get up close all you find is another giant dollop of wishful thinking. Of course, there is an alternative favoured by some hair shirt hippies: install the windmills, don't bother with the back-up generation, and simply let the lights go out every now and again. Like, maybe every morning. And every afternoon. And maybe every evening as well. No, the sooner we crack on with those nukes, the better. PS Christopher Booker had an excellent article on the nukes decision over the weekend. As he mentions, if we build enough of them we'll be able to produce loads of eco friendly hydrogen via eco-friendly electrolysis (last seen in those General Science lessons). Problem over. Các sản phẩm collagen tốt nhất trên thị trường hiện nay. Chúng tôi, muathuoctot chuyên cung cấp những sản phẩm collagen tốt nhất, giá thành cạnh tranh nhất, đảm bảo 100% hàng thật chất lượng.